The Penitus Oculatus Agents are the security force of the Penitus Oculatus organization. They serve as a personal security and espionage force for the Emperor after the Blades disbanded. They are initially only encountered at the Penitus Oculatus Outpost in Dragon Bridge. 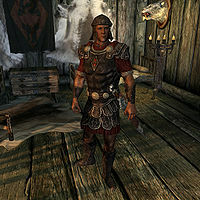 During the Dark Brotherhood quest Bound Until Death, a Penitus Oculatus agent is present at Vittoria Vici's wedding to ensure her safety. This page was last modified on 31 March 2013, at 02:35.